Yasmin Belo-Osagie is a Co-Founder of She Leads Africa, a Nigeria-based social enterprise that equips female entrepreneurs in Africa with the knowledge, network, and financing needed to build and scale strong businesses. She is a management consultant focusing primarily on developing growth strategies for a number of local and international corporates. In 2011, she spent a year attending culinary school and working as a sous-chef in the Mandarin Oriental in Hong Kong. Yasmin is a graduate of Princeton University with degrees in history and finance. Yasmin Belo-Osagie: My name is Yasmin Belo-Osagie. I’m half Nigerian half Ghanaian. I grew up in Nigeria until I was ten and then went to boarding school in England for 8 years. After this I went to Princeton University where I majored in history and minored in finance. Following this I took a year off and spent 6 months at culinary school (Cordon Bleu in London and Paris). During this time I spent 2 months in Hong Kong working in the pastry kitchen at the Mandarin Oriental. After this I moved back to Nigeria where I started working with McKinsey and Co, a management consulting firm. Women LEAD: You are a Co-Founder of She Leads Africa, a Nigeria-based social enterprise that equips female entrepreneurs in Africa with the knowledge, network, and financing needed to build and scale strong businesses. Can you tell us more about She Leads Africa and its impact? 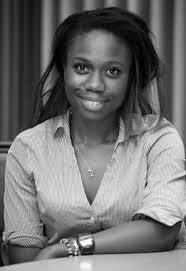 Yasmin Belo-Osagie: Entrepreneurship is going to be the broad based driver of economic growth in Africa. And whilst development organisations and institutions have been focused on empowering low income African female entrepreneurs, very little attention has been paid to the dearth of female business leaders across the continent. She Leads Africa aims to empower the women who have the ambition to be the business leaders of tomorrow, creating organisations that will hire millions of young Africans and promote development across the continent. To date, we have hosted the first even all female pan-Africa pitch contest, sponsored eight entrepreneurs attending an Investor Demo Day in Washington, D.C., established a partnership with Intel to conduct workshops for tech entrepreneurs, begun negotiations with Nigeria’s largest bank to create a low-interest lending program for female entrepreneurs, and started work on an online education platform that will feature African case studies taught by business experts. After attending our pitch competition, Aliko Dangote, Africa’s richest man, was impressed by the quality of entrepreneurs trained in our 6-week mentorship and has earmarked $1m in low-cost loans for us to give out. We have been featured in a number of reputable publications including Forbes, Black Enterprise, Fox Small Business , Fast Company, and Ventures Africa. My co-founder and I were recently selected as 2 of Forbes’ 20 youngest power women in Africa. That said we both acknowledge that we have much further to go. Women LEAD: What have you learned about the state of women’s entrepreneurship through your work founding and leading She Leads Africa? Yasmin Belo-Osagie: There’s a generational mindset shift occurring amongst African female entrepreneurs that African women have always been entrepreneurial. Indeed of all the regions in the world, Africa has the highest rate of female entrepreneurship in the world. My family is a good example of this, both my grandmothers as well as my mother were entrepreneurs. That said I’ve found that in the older generation most African women had aspirations to be small and medium business owners. Whereas today women believe that they can become titans of industry and create large multi-million dollar. Yasmin Belo-Osagie: My mother, who moved to Nigeria after marrying my father and started her own law firm, has always been a big impact in my life. She instilled in me the critical values of hardword and dedication. Women LEAD: What advice do you have for current and future women entrepreneurs? Yasmin Belo-Osagie: Turn every moment into an opportunity and get out there and hustle. No one will fight for your success if you don’t. 8 months ago I was working at McKinsey, I’d just broken up with my boyfriend of 4 years and frankly I was really depressed. I was looking for something to do and She Leads Africa was borne after a chance encounter with my cofounder. We’d known each other for a year whilst at McKinsey but I randomly ran into her at a conference and we came up with SLA whilst having a drink at the bar. The next few months were a whirlwind as we raced towards the pitch competition (our launch event). I was a Mckinsey consultant by day, an entrepreneur by night with 2/3 hours of sleep in between. It was a constant hustle with problems coming at every opportunity but that’s what being an entrepreneur is about. You’re creating something that doesn’t exist; that often times the world often doesn’t think is needed. You need to fight for relevance every day. Yasmin Belo-Osagie: Not really – real life is. I look around me and see the dearth of African female business leaders, the need for development and the lack of jobs for young people like myself. That inspires me to get out and fight every day.